Rwanda is known as the “Land of the Thousands Hills” where nature is frugal and cattle are king. It could be said that at one time the land was peopled with farmers and shepherds. 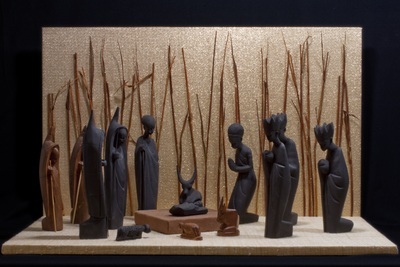 Rwandan Nativity sets show a special liking for shepherds. The kings are not absent from this set but, tall and slim, they look like crowned shepherds. The pointed hoods on the shepherds’ backs are little huts, “mobile homes” against wind, cold, and loneliness. Shepherds are nomads, people on the move. They are here, at the manger, for a moment, gathered in noble devotion. Reminiscent of the shepherds at the first Noël, they are a tribute to the one shepherd who will go after the lost sheep, any lost sheep. 14 woodcarvings, some of which are painted black. Figures depicted include Jesus, Mary, Joseph, and three kings, as well as shepherds and water buffalo. The condition of the set is excellent. Exhibition label originally written by Fr. Johann G. Roten, S.M. for exhibit entitled "Elisabeth's Nativity House: The van Mullekom Collection" held at Roesch Library, University of Dayton.